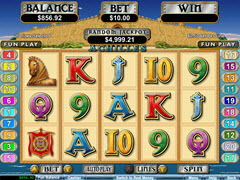 Achilles is a video slot that is found under the Real Time Gaming software. It has 5 reels and offers 20 paylines and throws in some scatter and wild symbols, a progressive jackpot and two different types of free spin bonuses that can be won. Achilles is based on a time when Romans were rulers of the land and fought battles that history had depicted both as romantic and violent. You gain an appreciation of this time in history through the images and graphics that are display throughout this pokie and by the character icons that fill the reels. Real Time Gaming had created this game several years ago when they first began to release their real series slots. It remains high on the list of pokies played under this software as it offers multiple features that can return healthy rewards. Many of the symbols are iconic in nature with people being exposed to lessons in history. You will see Helen of Troy, a battle shield, flag and a warrior’s horse on the reels and this is complimented by various letter symbols and numbers as well as two bonus feature symbols – Achilles and a castle. When ready to begin playing you may do so starting at $0.20 and should you wish can increase this to $100 through the use of a $5.00 coin. Achilles offers some nice graphics that while simple in design and execution are still pleasant to the eye. The game doesn’t offer the latest in animation but never games being released by RTG do. Still that is what makes this pokie appealing for many as it takes on a more simplified form of a pokie and focuses more on bigger payout rewards for the symbols that it offers. The jackpot that is offered is won randomly in Achilles and does not require that you hit a preset series of symbols on any given payline. Any spin of the reels that you take can result in the jackpot being awarded. You will know this the second it happens as the screen will be filled with notification alerting you to your new found good fortune. The scatter will award you with ten free games and is triggered by the Troy icon. 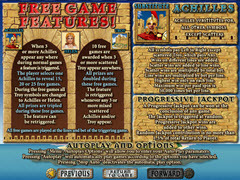 This free spin feature can be retriggered three different ways – by getting three more troy icons or by getting three of the Achilles icons or a combination off the two. This will allow for an additional ten free games and can occur multiple times with no limit on the amount of free games that can be won. All wins are doubled during the free games. Real Time Gaming has done well by this pokie and this is one of those time, tested and true slots that will have you returning for more.